The first of four ‘SPACE’ podcasts has just been uploaded, starring Steve Hall (of BBC3’s Klang Show) and Mark Westmouquette. It’s full of all your favourite astronomy/confectionery puns, and can be downloaded from the links under ‘PODCASTS’ up top. Thanks to the Wellcome Trust for their financial contribution and the STFC for a lovely new computer to do the multi-track recording. Multi-track is important so that we can edit Steve Cross’s annoying laugh out. This is brilliant. 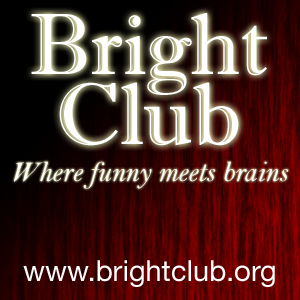 Simon Munnery, of whom I am a HUGE fan has agreed to compere Bright Club: Hidden Treasures at the Bloomsbury Theatre on October 26th!